Travalo are a brand I've spoken about countless times here on A Yellow Brick Blog. I have been using their original spray bottle for probably 4 years now and I think they are one of the greatest beauty products out there - I'm constantly recommending them to people! 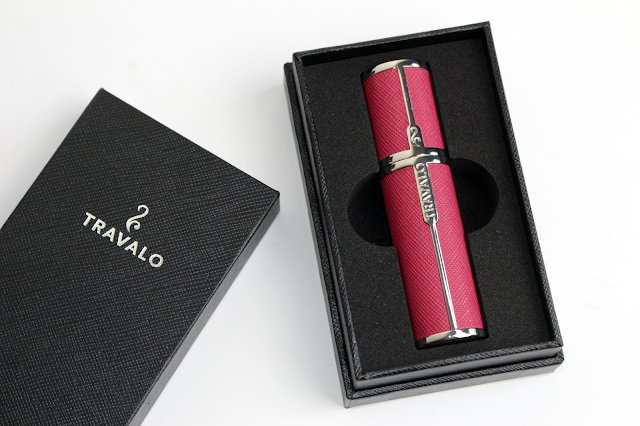 Travalo is an easy peasy perfume vaporisier that fits into your handbag so you can freshen up on the go wherever you might be. They are the perfect way to have your favourite perfumes with you 24/7 without carrying round your awkward glass bottles! 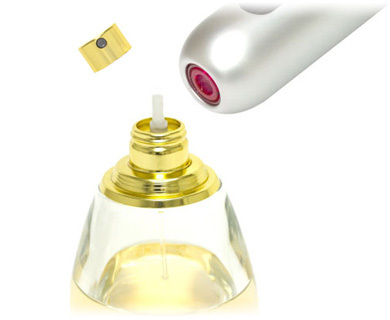 You fill the travalo in seconds directly from your standard perfume bottle - as you can see to the right! All you have to do is pump to fill, it's literally that easy. These are a must for me for holidays and weekends away, it saves on so much room and the panic of a possible breakage! So when I heard that Travalo had a new luxury collection being released I was really excited and when I was asked if I would like to try one out I was even more thrilled! 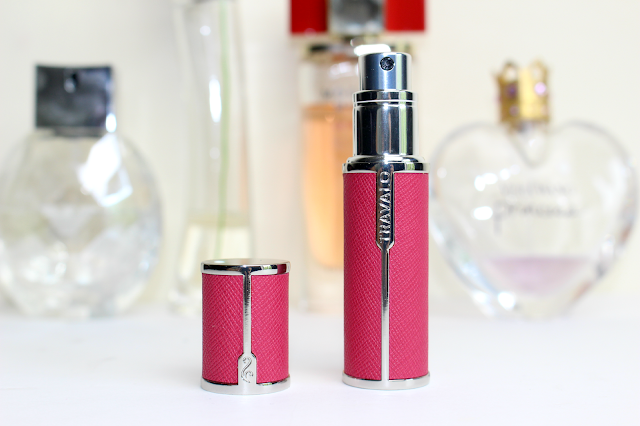 I have two of the regular bottles already and use them constantly but to have something which looks a little more sophisticated and luxurious is even better. There are eight colours to choose from, so there is literally one for everyone (and they aren't just for girls!) : Sky blue, black, white, red, baby pink, pink, navy & orange - as you can see I have the pink version. The new pioneering spray head now produces a finer mist which helps disperse your perfume over a wider area - great idea right? Not only this but the inner bottle can now be removed and is interchangeable with the travalo classic and other future models. This is SUCH a good idea in my opinion, I do hate it when I want another perfume with me but my current Travalo isn't empty yet so I have to stick with the one I already have filled. All in all I LOVE Travalo's new design, it feels and looks alot more up market and all the parts they have ungraded are just fantastic. The Milano collection is available from September 2015 at www.travalo.com and are priced at £35 each. I was a little surprised at the price jump at first but for something that will last years and years that you can use everyday I feel it is justified, especially for the high quality. Have you tried a Travalo before? I couldn't go on a night out or a holiday without one! The packaging of this looks great and it's such a good idea for people on the go!